For those that don't know, the book (and by extension the movie) has a special place in our hearts. I mean, we named our daughter Coraline. Neil Gaiman is one of my favorite authors, so I was already jazzed about another of his books hitting the big screen. But when we heard that the premiere was happening in Portland, well, we couldn't resist. Amber showed up at the box office the day they started selling tickets and snagged ours. Not surprisingly, within a couple hours things were sold out. Lots of anticipation leading up to the event, especially when Gaiman tweeted that he would be "sign, hug and wave" to whoever was there. In light of that tweet, we took off earlier than planned, heading downtown to the Schnitz. A big crowd clustered around the entrance to the red carpet, which we quickly circled around to get inside. And there they all were--Neil Gaiman, Henry Selick, Dakota Fanning, Teri Hatcher. We were back a ways, but it looked exactly like you'd expect of a red carpet. Lights flashed constantly. Reporters clustered in tight, holding boom mikes, lights, and cameras aloft for the shot. While I sincerely believe Gaiman meant what he twittered, security had other plans, constantly asking folks to keep the area nearby clear. While I was aware that Coraline was coming in 3D, it hadn't really occurred to me that the premiere would be in that format. Huge excitement then, seeing the piles of glasses in sealed plastic bags by the entryways. Our seats were a little close in and off-center but not enough to spoil things. My neck got slightly sore, but other matters submerged any pain once the film was done. Speeches led the way--Phil and Travis Knight, Henry Selick, Governor Kulongoski. Travis especially was hilarious as he described stop-motion animators saying, "When you get down to it we are a bunch of oddball nomadic mole people who play with dolls for a living." The lights dimmed, and finally the show began. This was my first 3D movie, and they got the film off to an excellent start. Initial shots with the various company names had 3D borders with multiple layers. Fairly tame, but they clearly popped out in a way that you just don't see on a 2D movie. The opening sequence begins with a doll being unstitched, and a needle swings out at you. It's the type of trick that 3D is made for. I grinned like an idiot when I saw that. But the 3D in Coraline wasn't just a trick or gimmick. After those initial shots, it integrated into the look of the film remarkably well. I've read comments about Selick wanting it to draw you in rather than stick things out at you. For me, it accomplished that fantastically. If you can see it in 3D (probably only for the next week!) get to the theater right away. I always enter film adaptations with trepidation. Books are my first love, and I hate to see my favorite works turned unrecognizable up on the screen. No worries here, though. Selick did a marvelous job of capturing the spirit of the book, both in the appearance of the peculiar characters and places, and in the tone of the storytelling. I'm not going to go all spoilery in case you haven't read the book (go read it now! ), but it held up for me. As you'd expect, there were changes made for the film version though. Two of the largest were in the setting and the addition of another character. The book took place in an old English house, while the film was set in Oregon near Ashland. While I loved the English tone of Gaiman's book, the overcast, gloomy rain of our beautiful home state fit the story well. Adding a major character is a more troubling prospect, but Selick and crew pulled it off. In many ways, this seemed like one of those changes translating a book to film. On the page, Coraline spends lots of time, especially in the early going, alone as she explores her surroundings. While a book gives inner monologue, those long stretches of just Coraline wouldn't have worked as well on screen. Giving her another character provided more interaction, more dynamic scenes, and ultimately a more fulfilling experience. Overall, this was one of my favorite films in a long time. The animation is stunningly beautiful and original. It doesn't look like anything else I've ever seen. Here's hoping that Laika reaps a huge harvest so they can go on creating more films like this! One of the biggest surprises we learned after getting the tickets was that they included admission to the after party. It was already a thrill to attend a movie premiere, but the after party too? I was floating the whole afternoon after Amber told me that. 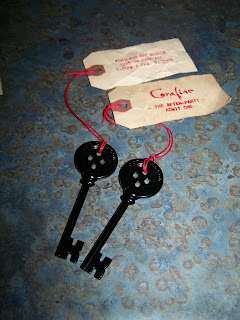 The "tickets" for the party were gorgeous metal keys like one featured prominently in the film. They were also used extensively in the marketing Wieden-Kennedy did for the movie. 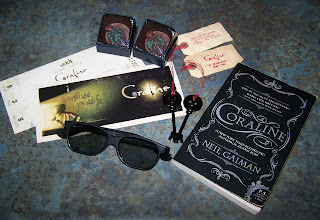 I'd seen pictures of them on Gaiman's blog, but never thought I'd actually get one. The path from the Schnitz over to the Portland Art Museum, site of the party, was lined with paper bags glowing with small candles. There's a few great shots of it over on Kitty's Neverwear blog. We joined the huge line streaming in. The room was packed. Colored lights gave everything a flashy, festive atmosphere. Servers with food pour into the room constantly. In the entryway, we saw Henry Selick talking with some people. Rather than interrupt, we calmly went past, although Amber brushed against him to make her way. It was so strange to be there next to a well-known director. It just didn't seem real. Around the edges of the room were displays showing off many of the props from the movie. Some of the artists were present too. Seeing those drove home how much work making the movie must have been--the models were intricate and all handmade. We were especially impressed by Anthea Chrome who knit Coraline's sweater and gloves... with thread. I have no idea how she doesn't go blind. We circled the room a couple times, looking at the exhibits, enjoying the atmosphere, but mostly looking for the man himself--Neil Gaiman. Up near the entry were a couple VIP areas, but we didn't see him there as we passed. Since we had a babysitter and it was getting late, we were getting ready to leave. Amber decided to take one last look, and she spotted him. For a moment we hesitated. Was it acceptable to talk with him, or would it be an imposition?While we dithered around, someone else walked right up with a book, and Gaiman gladly signed it. We took that as a sign and got in line. Amber pulled our copy of Coraline out of her bag, and we asked if he'd sign it. He asked who it was to, and we told him for our daughter Coraline. The look of genuine surprise and enjoyment that lit up his face was awesome. If it was possible, he became even more friendly as we showed him a picture. I'm sure this isn't the first Coraline he's heard of, but he acted as if it might have been. 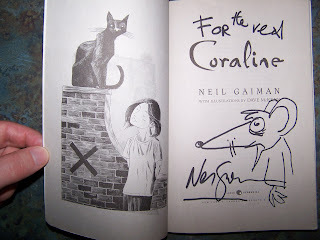 Above the title on the first page he wrote "For the real" Coraline, and then proceeded to draw a splendid little rat before signing his name. We chatted briefly, telling him how much we love his work. He acted almost bashful. He's commented before on his blog that it seems slightly absurd he gets to make things up for a living. You really got the sense that's how he feels about it--just very lucky to be able to do what he does. Other folks were waiting then, so we thanked him profusely and floated away. The whole way home we both couldn't move the smiles from our lips. 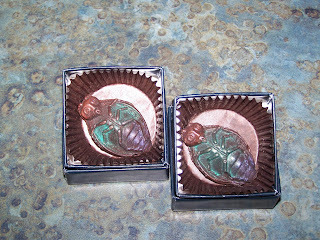 On the way out they had little chocolate beetles to take with. It'll make sense once you've seen the film. "The real Coraline" saw the rat you drew and said "za-zoo." Thanks for making our evening go from great to spectacular. Didn't expect any specific response, but the next day I got a notification email that @neilhimself was following me on Twitter. Now when I tweet about my lunch or the build breaking, one of my heroes might see it pop up on his computer screen. Cool. Here's the whole haul. What a fantastic night. Too fun, J! I really don't know much about this Neil guy... ;) but it sounds like you had a fantastic evening! Can you tell me... how does the 3D thing work? Is it embedded in the movie or something special that they do in the theater? ie, if we rented it and had the appropriate glasses would it still work? Sadly, I'm not sure it's even showing here in Wenatchee. With the 3D you get special glasses that you have to wear, although they aren't anything like the old red/green colored specs you see in pictures from the 50's. It's a special projector involved--if you look at the screen without the specs, it looks kind of blurry and strange. As far as I know, 3D is a theater-only experience at this point. hopefully, the DVD (or blue-ray) version will be in 3D. 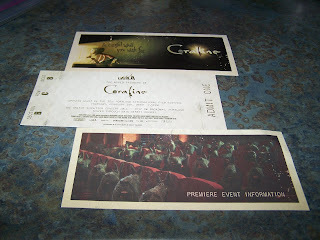 All the previews that we saw before Coraline were in 3D as well. Hopefully, not a passing trend.